I’m honored to be working on such an incredible project. See details below along with a beautiful write up from the incredible Laura Lasco on ways Houstonians can make a difference in our city’s homeless animal epidemic. And if you adopt a pet through this project come to Evin Thayer Studios Houston photography for a portrait session of your new family member and I will forgo the session fee (a $225 value). Prints will be from our normal price list. -Evin Houston, we have a problem. We are one of the worst cities in the country for abandoned and homeless animals. We at Lasco Enterprises, the family and company behind Max’s Wine Dive and The Tasting Room, are passionate about the plight of stray animals. 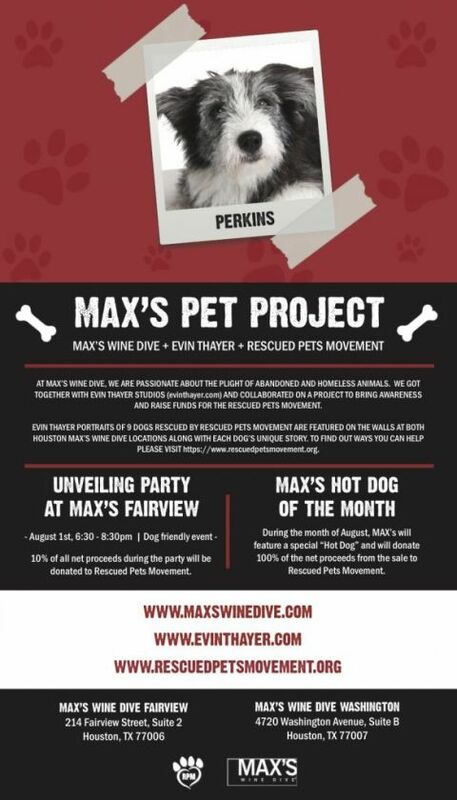 Fifteen-year-old Max Lasco, for whom Max’s Wine Dive is named, and his family have adopted four rescue dogs—three that were picked up right off the street. Most of the Lasco office team and many employees from our restaurants have rescue animals. To us, these animals are family. “MAX’S PET PROJECT” puts a face on dogs that have been abandoned, mistreated and left to fend for themselves on the streets of Houston. Each of these dogs was saved by Rescued Pets Movement, a local nonprofit that takes animals from BARC and relocates, often out of state, to a foster group or a new home. Since beginning operations in late 2013, Rescued Pets Movement has saved the lives of over 27,000 homeless animals. One of Houston’s premier photographers and a long-time rescue animal advocate, Evin Thayer, graciously donated his studio and services to produce this series. These portraits allow you to see the animals for the sentient beings that they are, with incredible character and huge hearts, and make you think about the plight of Houston’s homeless and shelter animals. Educate Yourself About Homeless Pets—Whether it’s the staggering numbers of homeless animals (in the U.S. cats alone number close to 70 million, and dogs are indeterminate) or the extent of euthanasia, take some time to digest the issue. You’ll be armed with the facts as you encourage others to get involved, or at least to spay and neuter their pets. Consider Adopting a Homeless Animal—You’ll save a life and free up space for another homeless rescue. Become a Sponsor—Many shelters offer sponsorships for a single animal’s needs. Maybe it’s a dog with complications that make it hard to adopt. You can help cover the cost of food, medicine, and more. Provide Foster Care—Fostering helps with shelter space and allows more time for a dog, cat, or other pet to find their human. Petting and comforting, which provides socialization. Grooming, to make them more attractive for adoption. Walking dogs to give them some exercise and fresh air. Training, to help them learn obedience and other skills. Volunteer Unique Skills—Are you great with spreadsheets or with a camera? Shelters run on a slim staff. You might help in ways that increase animal health, care, and adoption prospects. Connect Kids with Dogs—Real, sustained change takes generations, and that means focusing on the next generation is as important as the current state of affairs. Engaging boys and girls with supply drives and day camps at your local shelter is a long-term investment. Donate Money or Supplies to Shelters and Rescue Groups—An old crate, toys, old towels, chew toys, even old newspaper and other pet resources are a great way to help.